Gordon trying to work out who his next victim is going to be whilst Jack is trying to remember his list of folks to thank! It was a big weekend for the Junior Section as they kicked off their fundraising efforts for the trip to Spain next March, where they will represent Scotland in the Home Nations Championships. 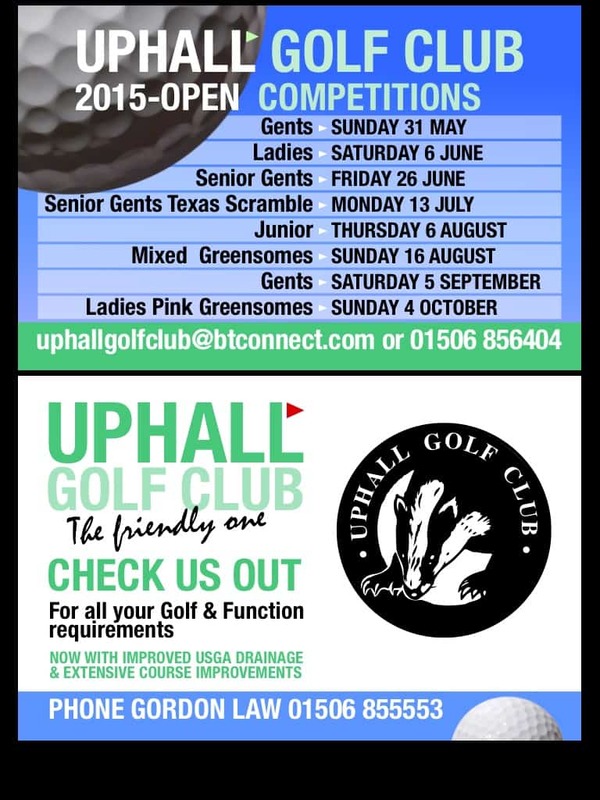 A Texas Scramble was organised and run by Gordon, which was fully subscribed, with 24 teams taking part. In bitterly cold conditions, the scoring was excellent and everyone who took part enjoyed themselves. 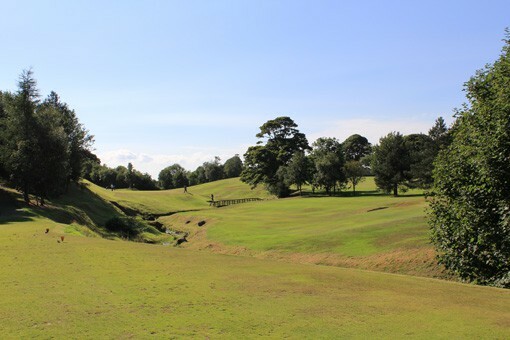 The most important result was that through a combination of entry fees, “Beat the Junior contributions” and the proceeds from the raffle for a 4ball at Archerfield (kindly donated by Gordon Bow Group, for which many thanks), the magnificent total of £1,920 was raised after all costs of staging the event. The Junior Squad greatly appreciate the generosity shown by everyone which as given them a great start in their fundraising. The raffle for the 4ball at Archerfield was won by Andy Grant. 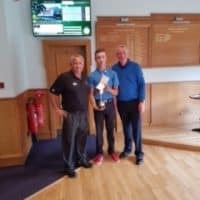 Jed Shirley was the winner of the “Beat the Junior” raffle and won a 4ball at Falkirk Golf Club, which he kindly returned to be used for future fundraising which was a great gesture – thanks Jed! The result brought about a landmark day, as two of the McKinnon family had to make speeches…..no comment as to who did the best job! 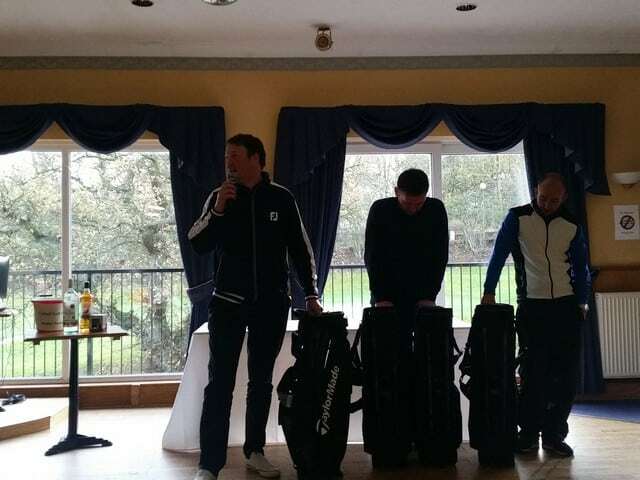 Scott McKinnon (Snr) in full flow of his acceptance speech, whilst Kenny and Colin try to work out what they’re going to do with another golf bag! Jack Cummings also made his media debut, enduring a Q&A with Gordon. 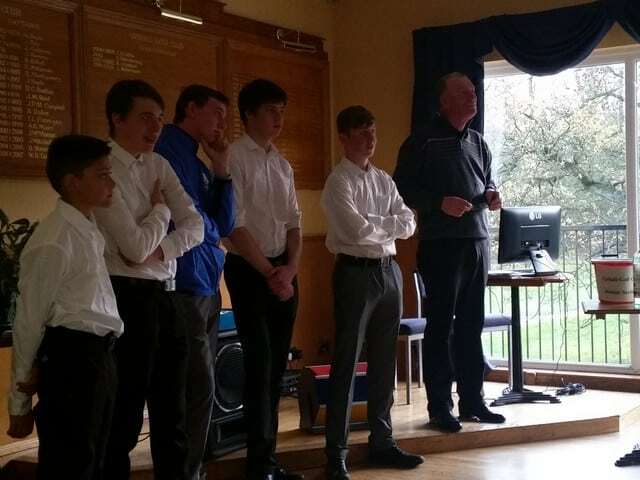 Not only that, after some of the members of the Junior Squad had spent 4 hours playing the 16th against each of the teams, they helped take orders, serve lunch, clear tables and generally show that they really appreciate the support which is coming from all quarters at the Club and from Sponsors, as they look to generate funds to make the trip to Spain one to remember. As always, these events don’t happen by accident, so thanks to everyone who had a hand in making the day such a success, not least Evelyn who gave up her Saturday lie-in to help with registration and look after the Pro Shop whilst everyone else was out “enjoying themselves” in the cold. The boys have other, less grand, fundraising activities planned to boost the travel fund, including car washing in Broxburn and bag packing at local supermarkets. Finally, thanks again from the Junior Section for everyone’s support – it’s fantastic.